Time for Vigyana Habba at Soul Kere! 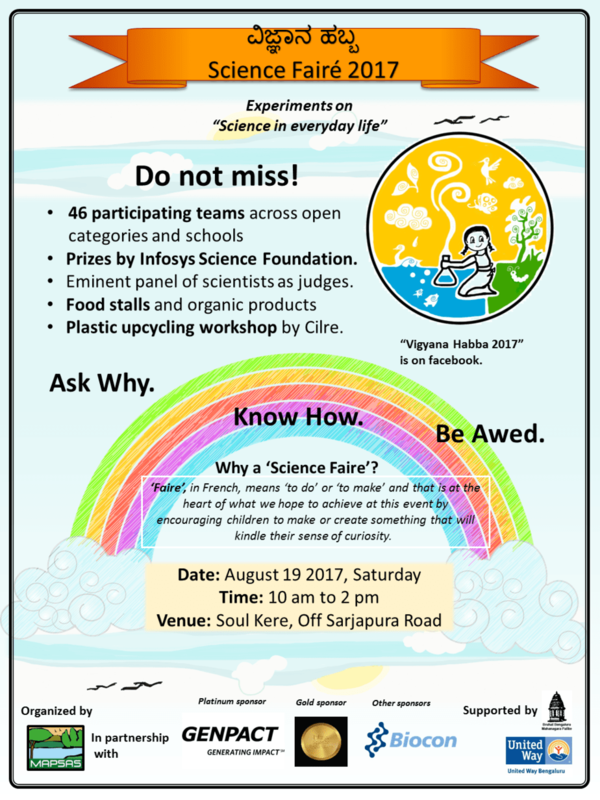 On Saturday, Aug 19th, 2016, over 45 teams will participate in the second edition of the Soul Kere Science Fair – Vigyana Habba. The participating students are from grades 1 to 12 of various school and communities in the neighborhood of the lake. The event is organized by MAPSAS and supported by Genpact,(Platinum sponsor), Infosys Science Foundation (Gold sponsor), Biocon and United Way Bengaluru. Entry to the event is free and open to all. The teams will demonstrate live experiments that explore the topic ‘Science in everyday life’. 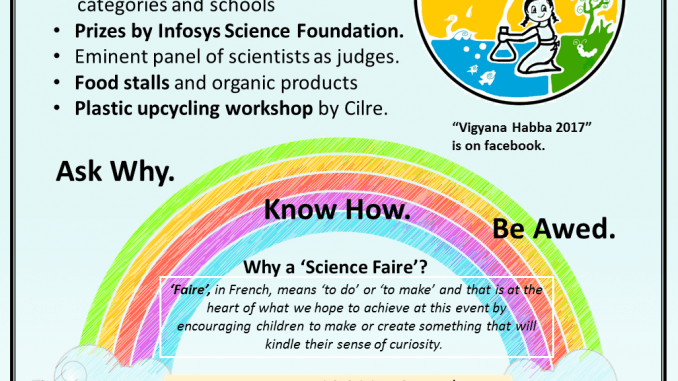 The fair is aimed to encourage a scientific spirit among children that questions, probes and finds solutions. It is not just a show and tell event – participants as well as visitors will learn by “doing” stuff. Judges include eminent experts like Dr. Sujata Virdhe, Former space scientist from ISRO; Dr. Lakshmi Saripalli, Astrophysicist at Raman Research Institute, Bangalore; Shubha Ramachandran, Water Sustainability Consultant with Biome Environmental Trust and Veena Srinivasan, ATREE. The prizes are sponsored by Infosys Science Foundation and Biocon. Apart from the experiments, there will be food stalls, organic products and services stalls and a plastic recycling workshop by Cilre. Soul Kere is one of the lakes in the chain that includes Kaikondrahalli Lake, Kasavanahalli Lake and Harlur Lake. An active citizen group, which set up the Mahadevpura Parisara Samrakshane Mattu Abhivrudhi Samiti (MAPSAS) Trust in 2011, has been working on these lakes alongside the BBMP and corporate sponsors.